Montague is the world's leading manufacturer of full size bikes that fold. 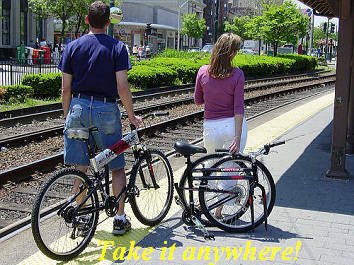 Montague bikes combine performance and portability into one small package to give you the most versatile bike possible. GREAT FOR BIRD WATCHERS TOO! 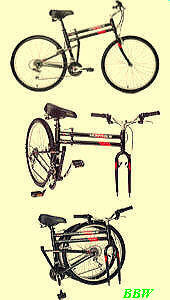 Folding a Montague bike is as simple as 1,2,3. There are no special tools needed and total breakdown of any model can be accomplished in under 30 seconds. • Stand on chain side of the bike. • Unlock the quick release lever on the front wheel - hold the adjusting nut in place while turning the quick release lever 5 or 6 times. • Remove the front wheel. • Stand on the chain side of the bike. • Open the quick release lever on top of the tube - spin counter clockwise 5 to 6 complete rotations. • Press and hold down the quick release and fold the bike with the handle bars turned away from you so they fold into the rear wheel. • For extra compactness, open the quick release below the saddle and lower the saddle all the way down.